MiniCap (free/donationware) is a screen capture utility that is small and easily installed, and never stays resident in memory. Based on the same code as Screenshot Captor, which I have reviewed favorably. 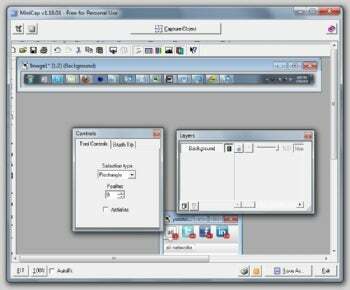 MiniCap can best be described as "Screenshot Captor lite," as it's stripped-down and less obtrusive. Perhaps a little too stripped-down, though. It's easy to select part of a captured image in MiniCap and crop it. One drawback is that MiniCap doesn't create an icon or folder for itself in the taskbar, nor is it in the Quick Launch area. The only way to fish out MiniCap is to alt-tab until you reach it. This is really unusual among applications, and it makes it really distracting, as there's no hotkey that activates MiniCap itself--you must page to the app and click Capture Object. Then, you have to find what you're capturing, resize the red window around it, hold down Control and click. This seems really un-user friendly. I know that MiniCap's selling point is that it doesn't reside in memory whatsoever, so it saves on system resources. However, while the app is open, wouldn't it be useful a single hotkey that just takes a screenshot elsewhere? Also, having a user hold down a keyboard key while simultaneously clicking the mouse can be really awkward. A keyboard-only shortcut would be highly preferable. After capturing the screenshot, you can use MiniCap's bare-bones interface to crop the image further, add a drop shadow to it, save the image to clipboard, print, or save to a file as JPG or GIF. It'd be nice to be able to save to clipboard by default, but you must click the button each time only after the image appears in MiniCap. Although MiniCap is free/donationware, so is its stronger big brother, Screenshot Captor. And so is ZScreen, my screen capture utility of choice. Having reviewed numerous screen capture utilities of all shapes, sizes and functionalities, I keep coming back to ZScreen, and so should you. It's got the single keyboard shortcut, clipboard default, ability to save directly to image websites, and more. Unless you're in a real bind for RAM, MiniCap isn't your best choice.